This month's e-newsletter feature is the dynamic fundraising duo, Alisa Shelton and Lynna McGuyer who produce one of CCA's largest fundraisers each year - "All the Way for CCA" Golf Tournament. We are so grateful to them for the countless hours they put in, because without dedicated fundraisers from within our community CCA could not serve nearly the number of families we do. Read on to learn a little bit more about these two and their mission to make the world a kinder place. Tell us about yourselves... who are you, where are you from, and how'd you learn about CCA? Alisa: I'm Alisa Shelton from Pasadena, TX. I met Becky through Lynna, who wanted me to meet Becky and Wade... actually just to donate to Becky's fundraiser, but when I met her and realized what an awesome person that she was, she inspired me to want to do more. Lynna: I am Lynna McGuyer. I found CCA through Becky White, who I met as a student at Lee College when she was doing a fundraiser. I admired her because she was a full-time mother of a special needs child. I watched her do well in school and work on this fundraiser, so I knew that I probably could put her in contact with someone who could help raise more funds in a much faster manner, and I introduced her to Alisa Shelton. What do you like best about event planning and, in particular, All the Way for CCA? Alisa: Knowing that I am helping these children, it fulfills my heart. Lynna: Watching the CCA families work together and seeing the results! What is the hardest part of hosting All the Way for CCA? Alisa: Getting our golf participants to respond and commit in a timely manner. Lynna: Trying to find the time that it takes! How long do you work on planning the event? Lynna: Since I have a full time job, I am only able to dedicate a few hours and help Alisa when she needs me to. What would you tell someone who is thinking of starting their own golf outing or other family fundraiser? Alisa: You need time, contacts, patience, and a passion for your cause! Lynna: You need time, contacts, patience, & a passion for your cause and you need money! How do you convince people to donate or volunteer and get involved? Alisa: At the beginning, my network and my relationship with them is why they listened, but now it is because they want to help the kids. One of our players made the statement this year, "We play in a lot of tournaments, and spend a lot of money, but this one tugs at our heartstrings." We know we have a good thing going here! Lynna: By showing them pictures of the kids explaining to them with the families go through. Then, showing them what we have done already and how we want to do more. Did you have professional experience fundraising or planning events before you started All the Way? Both: We don't! There is no relaxing while doing a fundraiser...haha! But we like massages and to workout. Our mission statement through our nonprofit organization, EMW, is "Helping people who want to help themselves." Becky has been the inspiration behind our creating this event. Why do you want to make the world a kinder place? Alisa: I have been blessed in my life and I am grateful that I am able to share that with others. Lynna: I believe that everyone has a kindness in them, it just takes someone to bring it out and recognize it ... somehow I am blessed with that vision. What do you hope for the future of CCA? Alisa & Lynna: That they get more national recognition, allowing a better future for these children and their families. Alisa: First of all, it is Becky White! Now that I know Becky personally, I have learned where she came from, and I have watched her, through hard work and perseverance, show others that if you persevere, you can change your life, reach your goals, and make a difference. Becky never gives up! She stays in contact with me weekly to let me know what is going on in her life, causing me to realize her appreciation for my work with CCA. I admire what she is doing, because she tries to make a difference in the world, her family, and her personal life. Additionally, since going to the retreat in California, I have come to be inspired by all of the moving parts it takes to make CCA successful: the doctors, the parents, the siblings, the tireless effort that is put in by the administration... in reality our tournament is just a small part of the big picture! Lynna: Becky White and her family, I watch the efforts of Wade, Becky, and their children to create a normal life for their family, and knowing where they both come from, has allowed me, even more, to appreciate their success. Additionally, Alisa inspires me! She is so consistent in helping people, her dedication and where-with-all to help others is tireless! CCA: Both of you inspire us! We also want to extend our sincere gratitude to all the "Texas Moms" who are also instrumental in the All the Way efforts. Thank you Lisa Bock, Jennifer Kilmer, & Becky White! Thank you all so much for all of your hard work and dedication to CCA and the kids and families we serve. 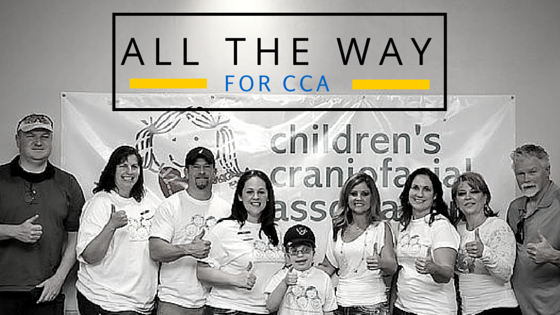 We can't wait for the 4th Annual All the Way for CCA Golf Tournament on April 15, 2016 in Houston, TX. Register today!